"I've been coming to bars for a long time...and never have I seen someone crush a shot glass with their bare hand." History is full of references to the Bible, largely because Christianity is one of the world's most predominant religions. Those references buttress tales of demons, angels and everything in between. Modern Testament #1 published by Insane Comics is a book that has the everything in between covered. The issue is written by Frank Martin and lettered by Kel Nutall. 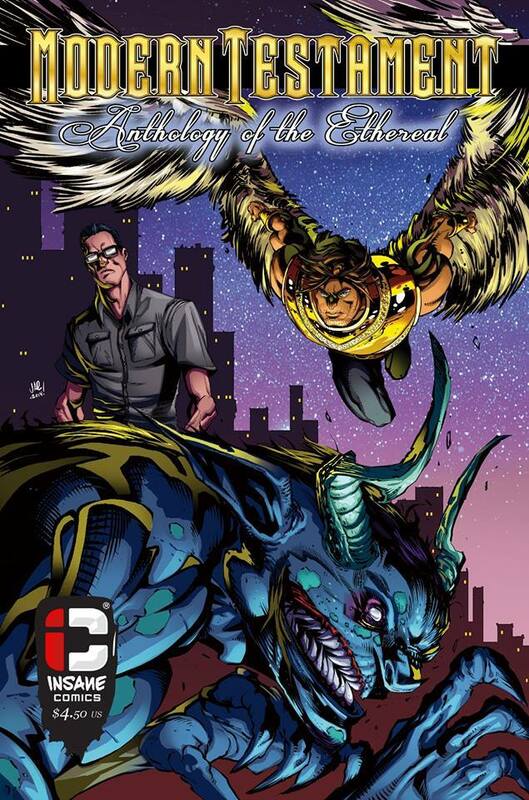 "Fallen Angel" is penciled by Federico Zumel, inked by Jeff Coney and colored by Jay Mayano, "The Bad Guy" is illustrated by Branco Jovanovic and colored by Eugene Betivu and "Feast or Famine" is illustrated by Tomasz Witas and colored by Sara Machajewski. Modern Testament #1 is comprised of three short stories. "Fallen Angel" is about one angel fighting who is presumably Lucifer on Earth. "The Bad Guy" is about a demon possession as a means of scaring someone straight. And "Feast or Famine" is about the lack of respect Famine (of the Four Horsemen of the Apocalypse fame) feels in regards to his curse. Martin's approach across all three stories thrives on religious underpinnings, which works to great effect for the tales. "Fallen Angel" feels a little stale from a story standpoint, as the concept of angels fighting one another isn't entirely new, but Martin at least gives the reader an interesting fight to follow. "The Bad Guy" and "Feast or Famine" are definitely much more intriguing. "The Bad Guy" essentially praises the demon in a possession, presenting him as a necessary evil at times to give families an event that galvanizes their bond. "Feast or Famine" presents the Horseman Famine with an inferiority complex, as Martin uses civilization's propensity for gluttony as a means of trivializing Famine's potential impact. Both stories are pretty fresh takes on the concepts and Martin does well in their presentation. 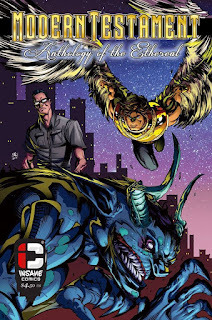 Of the three stories, "Fallen Angel" gives off the biggest superhero vibe, which is appropriate considering the magnitude of the battle between the two main characters. Zumel's pencils showcase fairly detailed characters while Coney's inks skew darker (further accented by Mayano's emphatic colors). "The Bad Guy" looks the most terrifying of the three, as Jovanovic does a great job illustrating a truly fierce-looking demon whose appearance manages to mix with the target of the possession, while Betivu's night color palette cast a shadow over the entire story. "Feast or Famine" features characters who demonstrate plenty of emotion through Witas' facial expression work and Machajewski's colors feel appropriate for contrasting the approaches taken by the Four Horsemen. Modern Testament #1 is a collection of three stories that all use religion as a backdrop. In that regard, they're interesting and clearly show an understanding of the core ideals underpinning a fight between angels, a demonic possession and a jealous Horseman. Martin's script is clean and--at times--poignant, drawing upon that religious understanding to get across a broader message. The artwork maintains a certain consistency to it, despite the varied artists throughout. Modern Testament #1 is a solid collection of tales with religious underpinnings that has some new views of storied concepts. Modern Testament #1 is available now.